The Israeli government has approved a Jewish group’s plan to build a museum over a centuries-old Muslim graveyard in Jerusalem, an official confirmed Wednesday, in the final go-ahead for a project delayed for years by Muslim opposition. The bitter wrangle over construction of the Museum of Tolerance reflects the explosive potential of religion-based disputes in Jerusalem, where Jews and Muslims often play down the other side’s historical ties to the city. The museum, which is meant to promote coexistence, is a project of a US-based Jewish group, the Simon Wiesenthal Center. Israel’s Interior Ministry granted a building permit on Tuesday and construction can begin immediately, said Efrat Orbach, a ministry spokeswoman. Although permits are usually granted by a municipality, authority was transferred to the government ministry due to the sensitivity of this case, Orbach said Wednesday. Muslims sought to stop the project on religious grounds, saying the old graves must not be desecrated. Israelis charged that with their opposition to the museum, certain Muslim groups were trying to establish a political foothold in the Jewish part of Jerusalem. The project is located in west Jerusalem, which is populated mostly by Jews and has been under Israeli control since the state was founded in 1948, unlike east Jerusalem, captured by Israel in the 1967 Mideast war but claimed by Palestinians as their capital. The Wiesenthal Center, named for a famous Nazi hunter, is modeling the new museum after its existing one in Los Angeles. Spokesmen for the project and the Islamic Movement were not available for comment Wednesday. The irony of a Jewish-sponsored Museum of Tolerance going up in part on a Muslim cemetery has made the project a target for critics since it was announced in 2003. Israel’s Islamic Movement and other groups tried to block it by appealing to the Supreme Court. The court rejected their petition in 2008, noting that Israel has more archaeological sites per square mile than any other country in the world, and buildings are often constructed over graves. Instead, the court ordered excavators to remove the graves and bones they unearthed to an alternate location located along the perimeter of the construction site, but outside the area where the museum is to be built. Ultra-Orthodox Jewish groups often demonstrate and riot at Israeli construction sites where they claim ancient Jewish graves were once located, often forcing changes in building plans. The Wiesenthal Center notes that when the British ruled the area before Israel’s creation, local Islamic leaders granted religious dispensation to move graves in the cemetery to clear the way for a business center, hotel and park, which were never built. The Islamic Movement rejects the validity of that ruling. 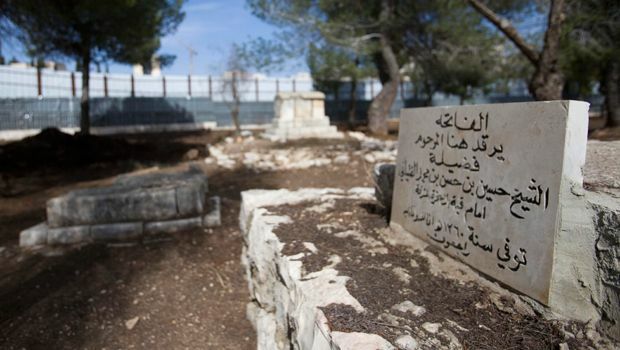 The saga of the cemetery took a bizarre turn last year when Israeli authorities accused Muslims, who had been cleaning and restoring graves at the cemetery, of faking hundreds of graves to reinforce their claim on the site. Municipal authorities destroyed new tombstones that the Islamic Movement put up on what it claimed were old graves. The Islamic Movement denied that it faked the graves. 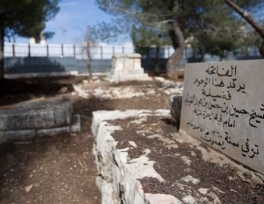 Yitzhak Reiter, a historian who has been following the controversy, estimated in an interview with Israel Radio that remains from 400 graves have been removed. There are hundreds more in the cemetery, but not in the section where the museum is to be built, he said.